Intuitively, we would expect this maxim to apply at the sub-national level too: aid will contribute most to poverty reduction in a country when it is allocated to its poorest regions. An examination of sub-national aid allocations could therefore lead to greater understanding of donors’ commitment to poverty reduction. However, the limited availability of sub-national data on both aid and poverty incidence has precluded this level of analysis. This is starting to change. As part of its “Mapping for Results” initiative, the World Bank has geo-coded its entire project portfolio of 2,900 active projects across 30,400 sub-national locations in 144 countries. Meanwhile, IFPRI’s Harvest Choice initiative has gathered together sub-national poverty data (using the international poverty line of $1.25 a day) from recent household surveys in 24 sub-Saharan African countries to draw detailed poverty maps covering half the continent. Both datasets contain, at a minimum, information at the first-order administrative level, meaning the province, state and governorate. 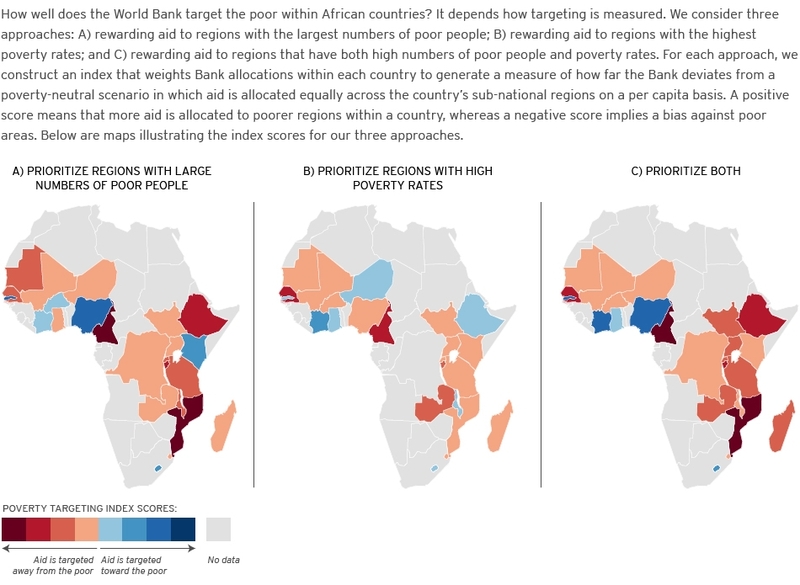 By combining these two datasets, we can begin to explore the allocative efficiency of aid with respect to poverty at the sub-national level—albeit for a single donor, in a subset of countries, at a particular point in time. The 24 countries we study contain 359 World Bank projects, which together are valued at nearly $19.3 billion. Our findings suggest that the World Bank rarely focuses its aid in the poorest regions in a country. However we refrain from casting judgment on the appropriateness of the Bank’s allocations due to unresolved questions concerning how targeting is measured, when targeting is appropriate, and how it can best be brought about. Our point of departure is to consider the different ways in which aid can target the poor at the sub-national level. One approach is to devote aid to regions that have the largest number of poor people. At the country level, this would be equivalent to giving aid to India which is home to hundreds of millions of people living in extreme poverty. Alternatively, regions with the highest poverty rates could be prioritized. This compares to giving aid to Liberia where four in five people live below the poverty line. The results from the two indexes are illustrated in Figure 1a and 1b. As might be expected, the two sets of results diverge. For instance, in Kenya, the World Bank is effective at targeting sub-national regions with large numbers of poor people, but avoids those regions with the highest poverty rates. While both these indexes capture something important, neither provides an adequate account of poverty targeting on its own. We therefore create a composite index which rewards aid allocations to regions where both the number of poor people and the poverty rate is high. At the country level, this would be equivalent to allocating aid to Nigeria, which accounts for the largest number of poor people in sub-Saharan Africa and has a high poverty rate of 68 percent. This index is illustrated in Figure 1c. In only 5 of 24 countries does the World Bank favor poorer regions as reflected by a positive score. 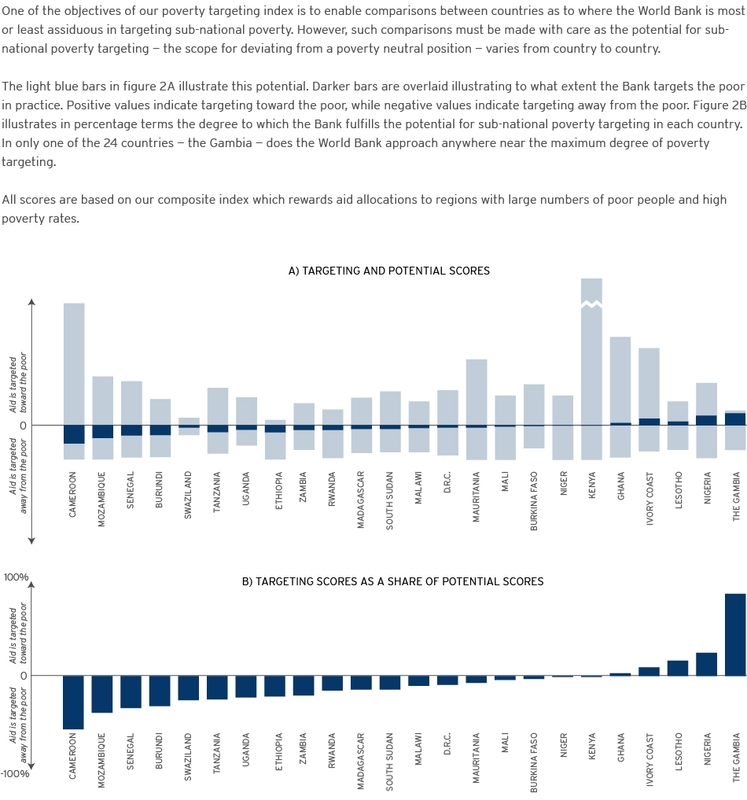 The indexes described thus far invite comparisons between countries as to where the World Bank is most or least assiduous in targeting poverty. However, such comparisons must be made with care as a score recorded in one country may not be achievable in another. This is because the potential for sub-national poverty targeting—the scope for deviating from a poverty neutral scenario—varies from country to country. This potential is determined by imagining two extreme scenarios in each country: where all aid is reallocated to the poorest sub-national region and the richest sub-national region respectively. The extent to which these two regions differ from others and the country as a whole determines what potential there exists for donors to differentiate themselves from a poverty neutral position. In our final index, we take the scores from our composite index and express them as a share of the maximum or minimum possible targeting score in each country. This index is illustrated in Figure 2. In only 1 of the 24 countries—the Gambia—does the World Bank approach anywhere near the maximum degree of poverty targeting. Interestingly, we find no relationship between the potential for sub-national targeting and the degree to which that potential is fulfilled. There remain a number of limitations to our analysis. Not least is that the significance of our findings hinges on the extent to which differences between sub-national units provide an effective lens for viewing the underlying level of inequity in each country. The risk is that our results are more indicative of the design of our indexes and the idiosyncrasies of the data that they capture. Rather than supporting sweeping judgments about donor intentions and performance, the value of poverty targeting assessments comes from their being combined with other sources of information and informing dialogue between donors and partner governments. However, even for this more modest purpose, there remain some significant challenges. Our analysis points to a number of questions that are likely to emerge in future discussions regarding the use of aid to target the poor, which we outline below. In anticipation of more frequent, sophisticated and complete analyses of poverty targeting, we believe these deserve proper attention. What is the salient level of analysis for assessing the allocative efficiency of aid? The ability to drill downwards in assessing the allocative efficiency of aid need not stop at the immediate sub-national level. In the future, better data could allow analysis at the village, household or individual level. Indeed governments and donors are taking advantage of breakthroughs in biometric identification and cell phone ownership to design increasingly sophisticated social protection schemes that target poor individuals—a feat that the aid community considered a pipedream only a few years ago. However, just because individual targeting is possible does not make it appropriate for all types of aid; neither is sub-national targeting always appropriate, even where aid projects can be accurately geo-coded (for instance, the creation of an industrial park). The aid community should avoid the reductionist view that poverty impact can be equated with proximity to the poor. What level of inequality or poverty is necessary for targeting to be an efficient strategy? The case for sub-national targeting is greatest when there is a danger that the benefits of aid will be captured by the non-poor. This seems less likely in countries where poverty rates are very high or where inequality is very low. In these settings, the transaction costs incurred in micro-level targeting may exceed the efficiency benefits of discriminating between different beneficiaries. How should poverty targeting efforts be coordinated? A true assessment of an aid agency’s allocative efficiency in a country requires an understanding of what other organizations are funding, including the partner government and other donors. The prospects for poverty reduction are almost certainly higher if aid agencies heed the wishes of the partner government rather than each unilaterally deciding to concentrate their efforts in the country’s poorest region. Poverty targeting measures should be used to promote, rather than to evade, a greater division of labor, led by partner governments.